The Historical Society: Was Santa White? As Nast’s Santa showed, the new prosperity was uniquely American. But the success Nast celebrated was uniquely American in a negative sense, too. It belonged only to the sort of people who read Harper’s Weekly: white, well-off, and well-represented in government. These were the nation’s new white-collar workers, middle men for the new corporations. They, and their wives and children, had more money and more time than Americans had ever had before. They had time to plan parties for their children, and to tell them stories of a well-fed man who would give them toys for Christmas—just because they were loved. These men were secure. Government economic policies guaranteed that the booming economy would continue to put money into their pockets, enabling them to continue to coddle their children (who would go on to be the first generation to go through high school and then college). But most Americans did not share this prosperity. In the 1880s industrial factories were growing while workers fell behind. Wages dropped and working conditions deteriorated. Farmers, too, were ground into poverty as overproduction depressed the prices of farm commodities. The economic dislocation of the era was terrible for white workers and farmers, but adding racial and ethnic discrimination into the mix made the lives of most African Americans, immigrants, and Indians horrific. At the same time, Congress sternly refused to consider any policies that might help these Americans. Living in dirt poverty, working when they could, their only experience with the prosperity of the 1880s was being blamed for their inability to participate in it. There was no jolly Santa Claus to bring toys to the children of southern sharecroppers, Polish steelworkers, Chinese laundrymen, or reservation-bound Lakota and Cheyenne. Thomas Nast’s American Santa was indeed white. But that’s not something we should celebrate. Really interesting to think of the origins of a version of Santa in the 1880s. 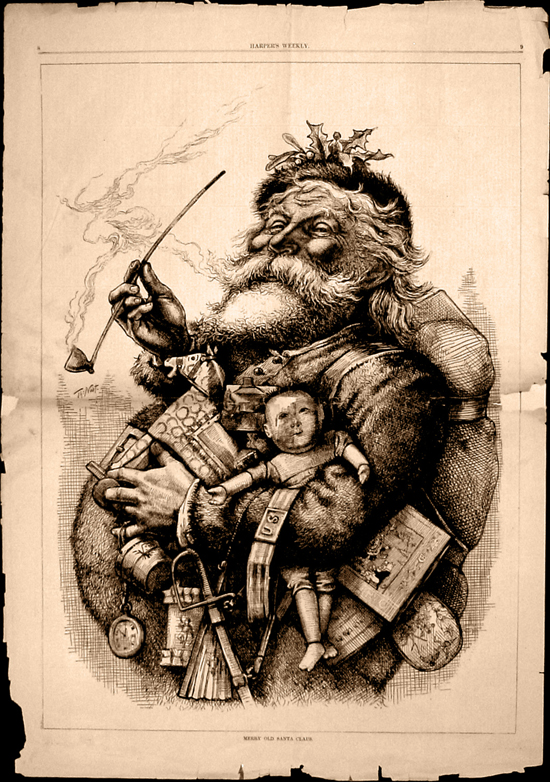 Gilded Age Claus. Who knew. The Santa timeline in the 20th century would include the coca cola version I guess.